Learn how to use Custom Codes in the Monkey Business Editor to easily add new features and functionality to your Monkey Business website and webpages. To embed custom code, simply right-click, select Publish, and select Custom Code. This Opens the Custom Code Library. The Custom Codes Library contains all your custom codes, and others shared by other Monkey Business Users. Click the Sync button to load any new custom codes shared by other Monkey Business users since your last sync. Custom Codes are organized into Categories, useful for filtering and locating custom codes that you want. Select a Category from the Category Selector Box to see the custom codes in that Category. 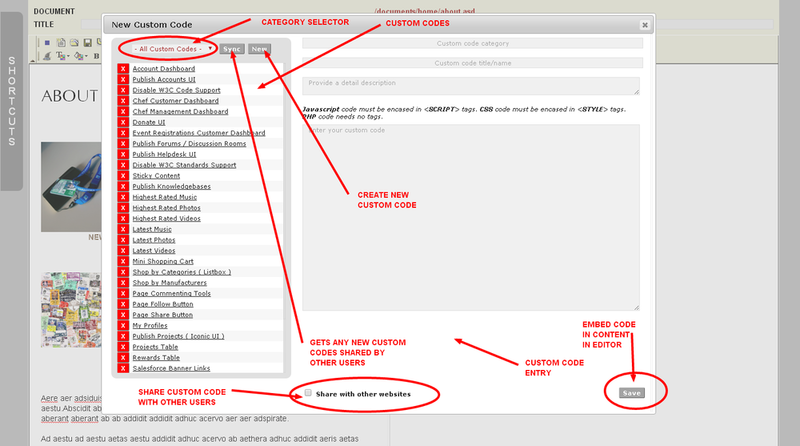 Click on any Custom Code to load it in the Custom Code Entry Screen. If you want to use it, simply click the Save button to embed it in your content / composition. Click the New button to clear the Custom Code Entry Screen, and provide a Category, Title, Description, and Code for the new Custom Code. Finally, click the Save Button to embed it in your content / composition. To share your custom code with other Monkey Business Users, simply select the Share With Other Websites option before clicking the Save button. Simply right-click on the Custom Code Content Manager Icon in the editor, and select Update Custom Code. This will open up the Custom Codes Library tool, with your Custom Code loaded in the Entry Screen. Finally, make your changes, and click the Save button.